Biography: Richard O’Neill is quickly rising to international prominence as one of the finest violists of his generation. With frequent performances throughout North America , Europe , and Asia , he has appeared as a soloist with the Los Angeles and Eurasian Philharmonics, and has an exclusive solo recording contract with Universal Music. His first album release for Universal, with pianist Warren Jones, was the top selling classical music album in Korea . Mr. O’Neill has collaborated with members of the Juilliard, Guarneri, Mendelssohn and Orion String Quartets, Ensemble Wien-Berlin, Gil Shaham, Cho-Liang Lin, Joshua Bell, Gary Hoffmann, Edgar Meyer and Steven Isserlis, among others. 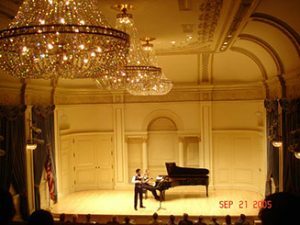 He has toured with the Chamber Music Society as well as with Musicians from Marlboro. He is also a member of the International Sejong Soloists, a string ensemble without conductor. A Universal Music Artist, he has recorded for Naxos , Centaur, and Tzadik. 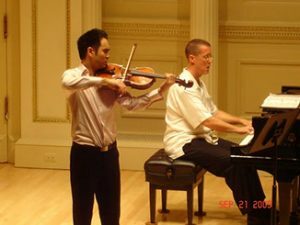 The first and only violist to receive the prestigious Artist Diploma at Juilliard, he has studied with Paul Neubauer and Donald McInnes. Mr. O’Neill performs on a viola made by Gasparo da Salo, Brescia Italy , circa 1590, most generously loaned to him by the Samsung Foundation of Culture.